"I Have One Answer: Let It Grow"
Coralie Herard:My name is Coralie. I'm twenty-three years old and I'm from Port-Au-Prince, Haiti. I am currently living in the States to complete my studies. NC: When did you start embracing your curls? CH: I decided 9 months ago to chop off all my hair. I went on a trip to Ecuador last summer and I was inspired to chop it all off because my perm was getting annoying. I wanted a change while I was there and I wanted to free myself. I had honestly never experienced hair breakage before my "big chop," so my family and friends had a heart attack and were so surprised when they learned I had cut my hair off! NC: What’s your current routine? CH: My regiment is simple. I make sure I always have my essential oils--coconut oil, avocado oil, etc--and my unrefined shea butter. Fortunately, my hair doesn’t need too much moisture. I keep it simple and braid my curls before I go to sleep, so they can rest for the night. But my secret is that I NEVER let my hair completely dry. 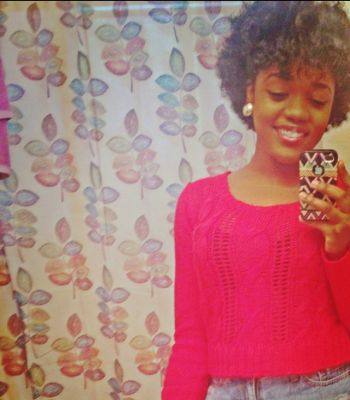 It is always moisturized and that keeps my curls healthy! NC: So from start to finish, on a curly day, what’s your process? CH: I moisturize and braid my hair before going to sleep. 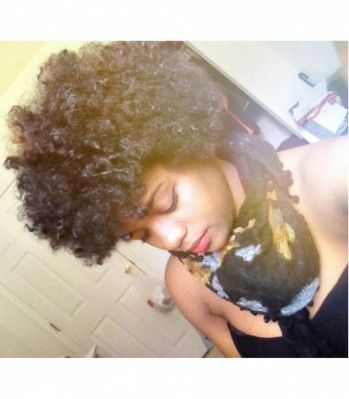 The next morning I unbraid it, adjust my curls as needed, and I'm ready to go! It’s the easiest way for me to achieve a nicely done look for the day. CH: Sometimes I don’t feel like putting too much effort into doing my hair, so I have a hairband and several scarves that I use. I pull my hair to the top of my head and wrap the hairband or scarves around it. Other times, I'll braid the sides and let the middle section of my hair fall. CH: As I mentioned earlier, my essential oils and shea butter are definitely my must have products. They work perfectly. NC: What about your hairstylists? CH: Me, myself, and I! CH: I've never colored my hair before, but I'm planning to color it by the end of this year. I'm a little scared of the unnatural ingredients and products...still thinking about it! CH: I seal my curls with a little bit of avocado oil, braid them and tie with a scarf. CH: My hair was pretty long when I had a perm…I spent six years of my life with long hair. When I decided to chop it all off, people thought that I was having a breakdown! But I got used to it and they don’t bother me anymore. Now I get a lot of "I love your head" comments. CH: I just big chopped and cut that hair off my scalp. The only insecurity I had was when I went back home from the stylist. Seeing my new face and my head shape was pretty intense to me. It was very revealing, but I enjoyed it. I got to see myself from a different angle. NC: What is the best thing about being a curly girl? CH: It’s actually exciting to see the unexpected changes that my hair makes. One day it coils tight, the next day I have loose curls and the next, a foxy and frizzy fro! 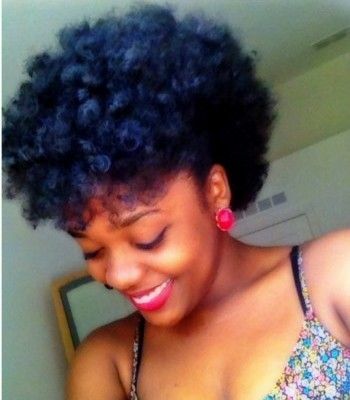 The diversity of natural hair is beautiful. 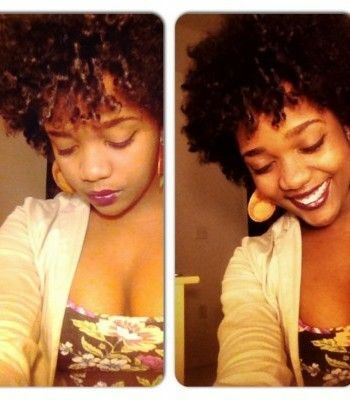 CH: It impacts my everyday life because not everybody that I meet rocks natural hair. People wearing weaves or people who have a perm ALWAYS ask me what I did to have the hair that I have now. I always have one answer: let it grow. It’s crazy how I have been complimented and asked for advice. I feel like a great mentor! CH: Enjoy your hair at all stages. Even if you just chopped it all off, rock it. There is nothing sexier than a confident woman with short hair. It’s beautiful and appealing. NC: Tell us about your life and what you are up to. CH: I’m an international student in the States. I will soon finish my degree and travel somewhere else. I’m a traveler at heart and I really enjoy new experiences. I am also a singer and a guitar player. Music is what makes me feel alive. You can find Coralie on Facebook or on Soundcloud.